Looking for a quick and easy lunch or dinner idea? These wraps are perfect! I did not think that these wraps would be very filling, but I was wrong! My husband and I each only ate one (with a side of pasta salad), and we were full! Plus they tasted amazing…like, way better than I expected such a simple wrap to taste! This recipe takes only about 10 minutes to prepare if you already have pre-cooked chicken like a rotisserie. I didn’t have any pre-cooked so I did have to take an additional 25 minutes to bake and shred the chicken, but it wasn’t a big deal. I was able to get out and mix together all of my other ingredients while the chicken was in the oven. Whisk the mayonnaise, cilantro, scallions, celery, sour cream and hot sauce in a large bowl. Add chicken and toss to combine. Sprinkle cheese over tortillas, leaving 1/2-inch border around edges, then arrange chicken mixture down the center of each tortilla. Roll stuffed tortillas and spray the tortillas all over with cooking spray. 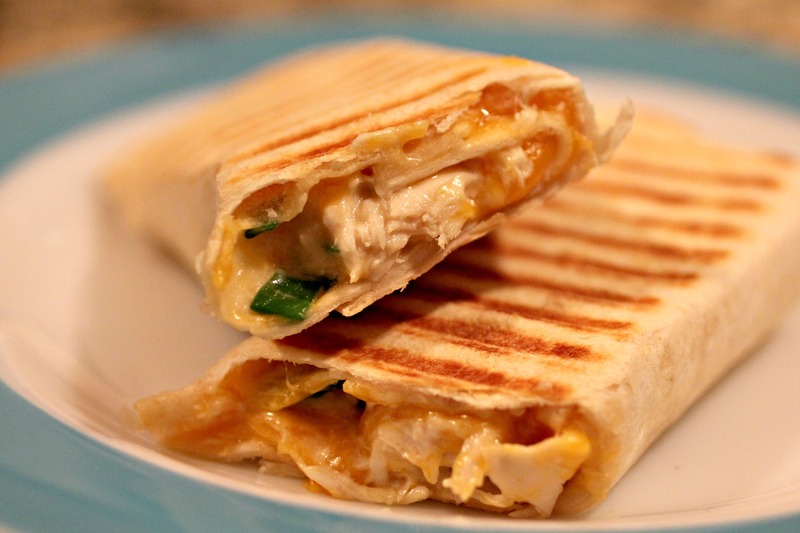 Arrange 2 wraps, seam-side down, in panini press and cook until golden brown and crisp. Transfer to a plate and repeat with remaining wraps. *If you don't have a panini press, heat a skillet or griddle to medium high heat, and cook wraps for about 3 minutes on each side, or until golden and crisp. These look SOOO good! I’m making these for my brother tomorrow! Hes going to love ’em! Thanks Sara Ann! I hope he does love them! That’s sweet of you to fix a meal for your brother! These look great! I really need to get a panini press……. I got a panini press as a wedding present, thinking I wouldn’t really use it, but I LOVE it! It’s not something we use every day, but we’re definitely glad we have it! Looks yummy! A nice alternative to a panini press is a cast iron skillet “grill pan”. Put the sandwich/wrap on the pan then put another heavy bottom pan that has been heated on a separate burner on top of the sandwich One less kitchen gadget. I’ve heard of people doing that but never have myself Thanks for the tip! gonna try this out using my g. foreman grill. Will let you know if this works. It should work just like a panini press! At least I think so…Hope you like them! So glad you and your family enjoyed it! Thanks for commenting! What I love even more is how this is such a great base recipe! I’m already thinking of how to make them Mexican (black beans, corn kernals, a little salsa), or Italian (tomatoes, mozzarella, spinach?). Thanks for the great start! Awesome! Glad they were a hit! The spinach trick is pretty genius, and I’m sure it tasted good too! If you’re looking for a good Italian wrap, you should check out my recipe for Chicken Pesto Mozzarella Wraps. It’s one of my favorites!